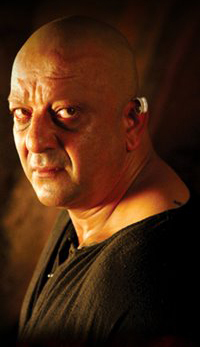 Sanjay Dutt is creating quite a stir with his latest portrayal as Kancha – the monstrous villain in Agneepath but Sanjay Dutt has been around for a while are there are two roles that deserve special applause. Most of his critically acclaimed roles are in movies that have come from the Vinod Chopra Camp. In his movie Eklavya, he portrayed a pot-bellied, rotund and seemingly corrupt, Inspector Pannalal Chohaar. His performance showed a completely different side of the actor. It marked him as a man- unafraid to give up the glamour of his persona and enter the character’s skin. In the movie Mission Kashmir, Sanjay played the role of Inayat Khan, a tough cop who deals with both terrorism and familial baggage thanks to losing a young son in a tragic accident. Dutt gave off a subtle performance with an appropriately stiff upper lip. One could even risk saying that his performance outdid that of Hrithik’s. In his most famous role of the Munna Bhai series, he played the role of a gangster in love with a comic twist, which was a completely different take in Rajkumar Hirani’s masterpieces Munnabhai and Lage Raho Munnabhai. Both movies proved that Dutt was a flawless actor – someone who could get tears to the eyes either through uncontrollable laughter or deep emotion. Now after the epic portrayal of Kancha, it will be interesting to see how he morphs into the skin of Munna Bhai for the next movie in the famous series. 16 queries in 1.042 seconds.